Riverbed Technology, a long time established leader in the application performance business is now poised to be the frontrunner in the new Software-Defined Wide Area Network (SD-WAN) market with its SteelConnect solution. Riverbed SteelConnect will set the benchmark in the industry for others to follow by eliminating hardware infrastructure complexity and aligning IT with the goals of the business. SD-WAN provides a transformational way to architect, and easily deploy and manage remote office connectivity. And Riverbed SteelConnect is a revolutionary SD-WAN solution that provides an intelligent and simplified approach to designing, deploying and managing distributed networks for today’s hybrid enterprise. SteelConnect is the industry’s first and only product that unifies deployment and orchestration of hybrid WANs, clouds environments, and branch networks. It’s time for some SD-WAN business. IDC has forecasted that the SD-WAN market for infrastructure and services will exceed $6 billion by 2020, and it estimates that the compound annual growth rate (CAGR) for SD-WAN will be more than 90%. Yes, SD-WAN is big business. Threat of New Entrants: is very high, and the commodity hardware trend makes it very easy for new players to join the SD-WAN market. With its proven track record in the technology sector, Riverbed has a distinct business advantage over the other entrants. Threat of Substitution: SD-WAN is too new for substitutions. It basically boils down to two choices: keep your existing WAN infrastructure or save money and make your life easier by implementing SteelConnect as your SD-WAN solution. Buyer Power: Buyers (businesses) have the power as there are a lot of competitors in the market. Hence, the price pressure is extremely high on Riverbed and its competitors. Supplier Power: Suppliers don’t have much power, as this technology can be installed on any commodity hardware. The buyers can either install the software on their own hardware or buy equipment with software installed on it. Riverbed provides both of these options as they have Original Equipment Manufacturer partners who supply the equipment. 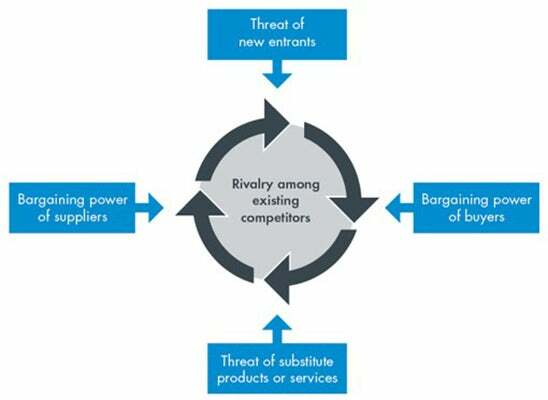 Competitive Rivalry: The competitors in this industry, range from big companies to small startups that compete on product differentiators and reduced switching costs for customers. Last year alone, Gartner identified about 12 vendors in this space. But, as a mid-sized networking leader, Riverbed is better poised to expand its business through product portfolio proliferation, and by leveraging principles of business intent management and operations of scale. SteelConnect is always ready to go head to head with the competition. Riverbed collaborates with cloud companies to build joint solutions that connect networks in disparate locations. The extensive use of cloud services such as Amazon Web Services and Microsoft Azure act as complementors to SD-WAN and Riverbed’s SteelConnect story, benefiting customers by adjusting their networks to match prevailing user and application requirements. SteelConnect complements the Riverbed’s solution portfolio extremely well. Riverbed strives to strengthen business relationships by introducing innovative solutions such as SteelConnect that adds value to existing Riverbed solutions already in place. When you see the benefits of combining Riverbed solutions, you will know what we mean by seeing is believing. SteelConnect leverages SteelCentral’s monitoring and visibility capabilities to help validate networking connectivity, thereby enabling design first and then cost-effectively deploy networks later. Riverbed is a proven business leader, will continue to expand its business through product portfolio proliferation, leveraging principles of business intent management and utilizing operations of scale. Riverbed has its sights set on the SD-WAN market, it’s nothing personal, and we’re just taking care of business. Riverbed’s connected strategy helps them move up their customers’ hierarchy of needs. Riverbed, we mean business.